Barry and Iris form a Husband and Wife Dynamic Duo to save Nora! Last week, Team Flash decided that, moving forward, they would make it their goal to appeal to Cicada’s heart by saving Grace form her coma. In “Memorabilia,” we see the results of that plan going south when a major speed bump is thrown in their way. Sherloque Wells brings a memory machine – La Machine a Memoire, as he calls it – to S.T.A.R. Labs for the team to sync up with Gracie’s brainwaves and enter her memories in an effort to free her from her unconscious state. Though the detective emphasizes the importance of two people going into the little girl’s mind, Nora, fearing her parents finding out the secret that she’s been keeping from everyone, goes under alone and becomes trapped when Gracie’s mind creates a defensive mechanism in the form of Cicada. 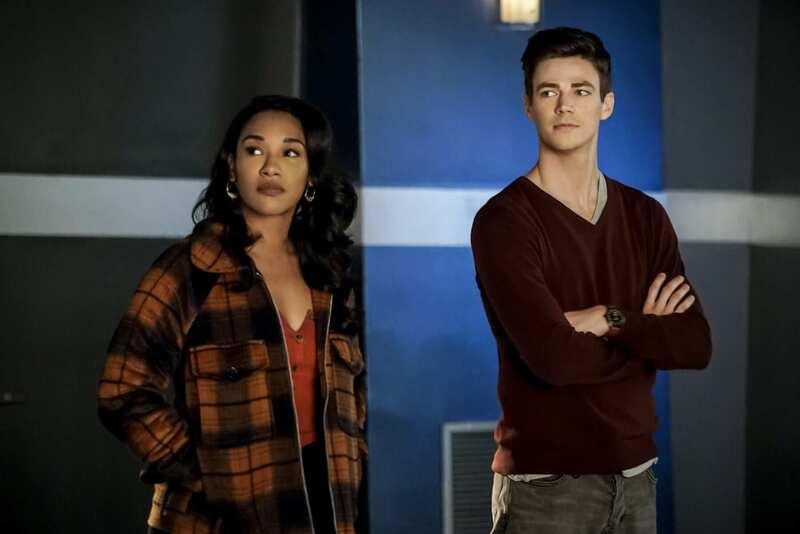 There are heavy thematic tones of the lengths to which one will go for family, and they play out in Nora’s self-justification for her apparent deception, Barry and Iris diving in together to save their daughter at risk to their own lives, and Gracie’s own desire to protect her uncle from Team Flash, as we will discuss in short order. The side story this week is Ralph tricking Cisco into going out to a bar with him on a dedicated singles night with the intent of getting the young scientist out of the lab and around some other human beings. Nora struggles from the outset of “Memorabilia” with deceiving her parents and the rest of the team of her true intentions in the present. To make light of her partnership with Eobard Thawne would also be a grave disservice, as we now know that she has been sending him messages via Gideon in the Time Vault for some time now. For the first time since this season began, we see the visible manifestation of her childhood pain and anger when Barry and Iris, who have themselves become trapped in the recesses of their daughter’s memories (instead of entering Gracie’s, as intended – something I suspect was an intentional accident thanks to Sherloque). The husband and wife witness a truly unnecessarily angry and cold future Iris interacting rashly with a very young Nora. This scene hits some serious emotional keys in Iris, who had felt like she and Nora were beginning to grow much closer. Add to that Iris’ increasing worry over the future, including down to the name of the newspaper she’s going to start, the Central City Citizen. Candice Patton is given a number of opportunities throughout “Memorabilia” to show off her acting chops in more real moments than we’ve gotten out of her in preceding seasons. Suffice it to say, she does a great job, and I think at this point I can firmly plant myself on Team Iris (which is the reverse of prior seasons, I assure you); I love seeing the script playing to her strengths while giving her room to actually stretch and be a real person. Throughout all of these difficult moments, Barry takes on the role of encouraging husband and, in truth, he takes a backseat for much of “Memorabilia,” at least thematically – which I’m fine with here. He continually makes an effort to reassure his wife that the person they saw in Nora’s future-past (ugh, time travel, man…) memories is neither the woman she is today nor that which she has to become. She need only choose not to be that person. To Iris’ credit, she’s dealing with the idea of losing her husband forever in the blink of an eye (one might say, “in a flash”), so that’s one of those easier said than done things. Regardless, Barry remains a strong foundation of positivity for his wife and stays optimistic that they can and will change the future (again). Once they’ve successfully retrieved their daughter from Grace’s memories, Nora and Iris have a heart-to-heart about how that earlier, terrible memory they saw of future Iris was made up in place of the warm and caring one that they saw prior to rescuing her. Nora explains that she was always angry as a child because she was robbed of her dad, so she channeled all of that anger and animosity to the only person who was there – Iris. This is one of the biggest growing moments for both characters and manifests itself in a visible catharsis. Now, if Nora could just open up about this whole “I’m working with my father’s archenemy” thing. “Memorabilia” ratios much heavier on the main plot line than in any other episode this season, and the side story with Ralph and Cisco is decidedly just that – a side story. Cisco has seemed incredibly aloof and distant since taking up his metahuman cure crusade, one that I feel is becoming a detriment to the character, but we vibe a little glimpse of good old Mr. Ramone when he begins dorkishly flirting with the bartender towards the end. Another thing from “Memorabilia” worthy of note are Cicada’s unnoticeable absence outside of a brief appearance in Grace’s memories. This only hammers home the point I’ve been making for weeks now: Orlin is unnecessary to this season and can exit stage left. The interesting development stemming from the revelation that Grace herself has a shard of DeVoe’s satellite in her head and is leaking dark matter into her brain is that the little girl has been able to hear everything going on in her hospital room, even while in her comatose state. This creates a problem, as that includes bearing witness to Orlin’s and the nurse’s hatred towards metas, resulting in that hatred being replicated by Grace and forcing the Flash Family to abandon their plans of rescuing Grace from her coma for now. As a fun side note, while Barry and Iris are in Nora’s memories (unbeknownst to them at the time), we hear about Cicada’s record-setting body count exceeding those of such notable villains as the Reverse Flash and the Red Death, which is an interesting mention. It could mean one of two things: either they’re fan-service teasing the Dark Multiverse counterpart of Bruce Wayne who absorbed Barry Allen’s body (and the Speed Force within it) and became the Dark Knights Metal villain Red Death, or they’re naming the Crisis event’s red skies this. I’m inclined to believe the latter of these is the more likely, but the CW has had an… interesting relationship with the source material, so I’ll hold off on placing any folding money bets for now. REVIEW: The Flash - Season 5 Episode 12 "Memorabilia"
A lack of the dull Cicada and a focus on strong familial ties as well as heart-string moments set this episode high on the tier list for this season. More character development and solid plot like this, please!